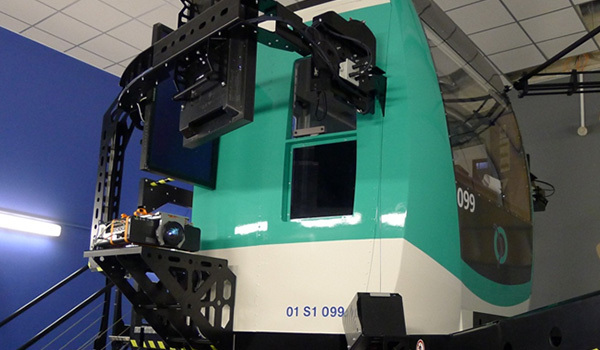 The RATP began training its drivers on simulators in 2014. Since then, it has continued to expand its fleet. The most recent order, made this summer, includes refurbishing the company’s 19 simulators as well as the supply of five additional desk simulators. The RATP project manager for metro driving simulators, Morgane Cozette, explains the reasons for this investment. Why this new order and why choose CORYS? The main reason: the operator is very satisfied with the simulators and asked for more. Their simulators have been used for initial training since 2014, with 250 to 400 new drivers trained every year. Experienced drivers have been coming for individual follow-ups and skills assessments since 2016. In addition, our training needs are increasing. We will have to train 500 Line-9 drivers how to use the new version of OCTYS*, our train supervision and control system. The wayside signalling will go away and be replaced by this new driving mode. Because the existing equipment is already used 12 hours a day, we thought it was time to expand our training capacity. Our investment is based on three criteria: profitability, efficiency, and ability to meet our needs. In terms of profitability, simulation allows us to use rolling stock less often to train drivers. It is also efficient. We train hundreds of professionals per year on a virtual line that recreates the exact network: curved stations, overhead rail lines and more. Finally, simulation meets training needs that would be impossible to meet otherwise. What are the needs? Is it learning about failures and degraded modes? Yes, exactly. When our drivers train with rolling stock, they learn on trains which are not in service, or what we call "ghost" trains that are usually used for testing. They discover the train operating normally, not the hazards that make the job difficult. Whereas training on simulators allows them to tackle difficulties such as a station with crowded platforms, a misbehaving passenger, equipment or signalling failure and more. Furthermore, an operator who has faced an unusual issue can ask to recreate the situation so that they can train their team on the correct procedures for the future. Would you say that simulation has won over the RATP? Simulation is holding a more and more important place within a company which was attached to traditional training, with an instructor facing a group of trainees. We must adapt to the digital revolution and attractive features such as interactivity, the CGI quality, or immersion. However, we also don't want to get too ahead of ourselves! You have also decided to upgrade your fleet and sign a 5-year refurbishment contract with CORYS, but why? The upgrade covers both the new hardware and integration of the new OCTYS signalling system. As for the refurbishment contract, it came from our experience. While we are able to provide in-house hardware maintenance and first-level diagnostics, we will always lack the expertise it comes to software maintenance and other fine tunings. It’s better to let CORYS handle this.